As I predicted, the rate of posting new entries on Game of Travel significantly dropped down. During my entire stay in Australia (over 3 weeks) already I haven’t been able to post even one entry on Game of Travel. I painted only for few hours over that time. Arriving to this nice, such different country made me forget a little about mini war gaming. Well, right now my holidays are over. After some perturbations, I’m on the Cairns airport sitting and waiting to my flight to Perth, where I can get connection to Bali.…It was awesome time, but it has been too long – Game of Travel need to be updated here and now. No matter the holidays and no matter my laziness – time to get back to work! 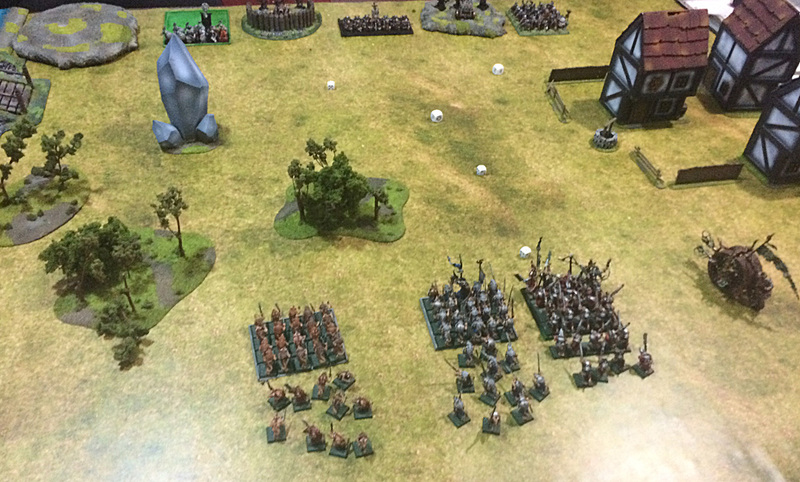 And as I have still one overdue battle report to write, so it will be my first blog entry after this quite a long break – battle between Skaven and Dwarfs. 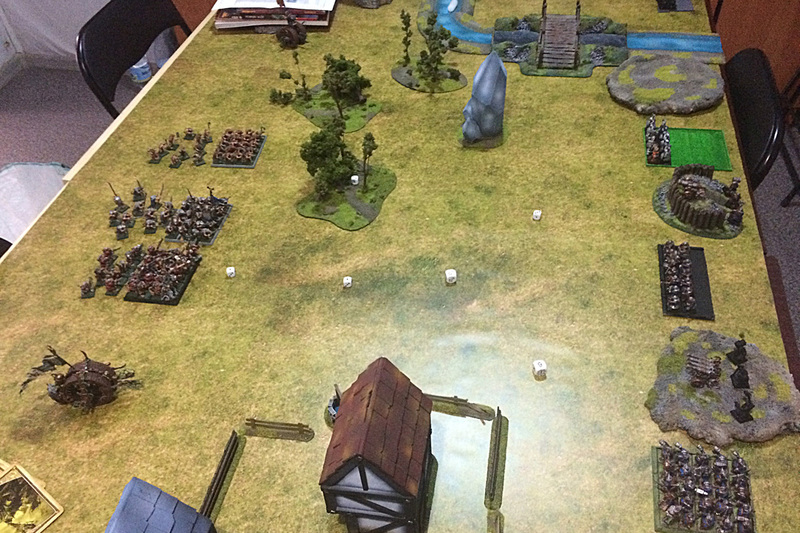 1200 points – Warhammer Fantasy Battle 8th edition rules. I was playing against Paweł, young, inexperienced player I met on Skaven FB group. 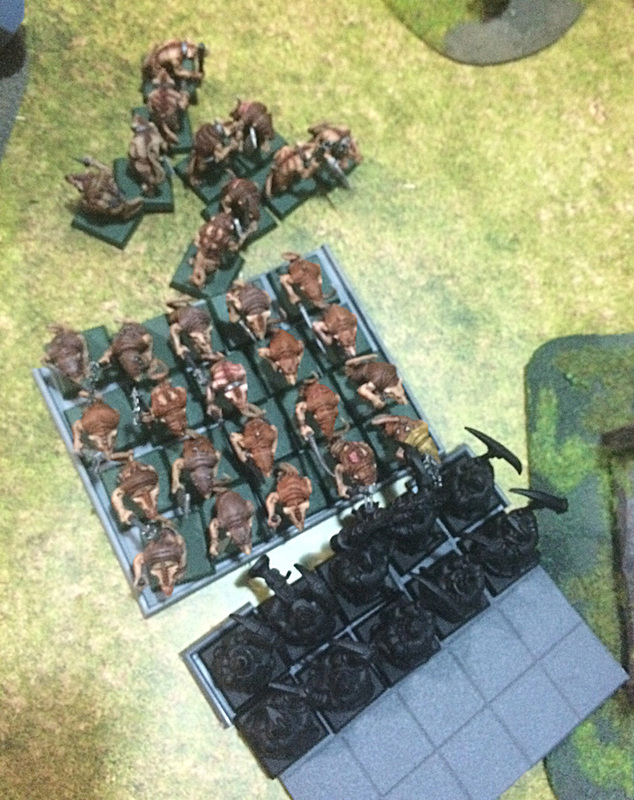 I know in my last battle report, I declared the story of Grey Seer Quicksqueek is over ( as he was slain by Bretonnian Knight), but the battle against Dwarfs popped out all of the sudden by surprise. I don’t have any new Skaven painted, so the story or Lord Quicksqueek got one more episode. And this time, it’s the last one for certain. We were playing in Bunkier Store in Warsaw. They have awesome table with plenty of scenery and super cool battlemat. The battle will take us at the beggining of Grey Seer Quiksqueek’s story.Right after his first assignment that he received from Council of Thirteen to take ancient Dwarf stronghold in the feet of World’s Edge Mountains. The whole task failed due to traitors of Clan Eshin scouts, who undermined all Quicksqueek’s effort by lousy reconnaissance. The Dwarf Stonghold were taken by Goblins and Dwarfs with ease recaptured their keep. Skaven lost the siege and they were forced to withdraw with their tails between the legs. The siege had the epilogue though. Dwarfs after taking back their stronghold, rushed after Greenskins and Skaven as well. Skaven army were caught near the Empire town of Weiler and Quicksqueek had no choice and stand to next battle against Dwarfs. …and other thing. At this point I’d like to apologize for the quality of the photos for this battle report. Right before the battle I realized that battery at my camera is empty, so there was no other option than to cover all the battle with iPhone. So I have what I have here, and I promise to be more careful next time. Dwarfs approached the fields of Weiler form the north and Skaven were forced to turn back and make counter attack from the south. Skaven on the south from the bottom: Doomwheel, Stomvermin with Lord Quicksqueek and Battle Standard Bearer, Clanrats with Chieftain Tax, Slaves, Doomwheel. Dwarfs on the north from the bottom: Dwarf Warriors with Thane, Organ Gun, Thunderers, Cannon, Longbeards with Runesmith. Miners will arrive little bit later (they will try to ambush Skaven from the flank). Thane Durgin Finnsson were almost a week after those vicious rat-men. He wanted them to pay for how they attempted of besieging his own clan legacy – The Stronghold. He was after Grey Seer for so long time and finally he got them! They stood on these fields and rat-men were forced to fight the battle. Thane Durgin was about to fight usual Dwarf tactics, like his father used to use, and before that, his father – deploy artillery and guns and shoot at incoming foes. Rat-men will reach Dwarfs lines eventually, but many of them will taste the lead and gunpowder. Thane gave his order. Cannon and Organ Gun shot! Loud and bright blast echoed over the battlefield and few seconds later first Skaven fell. 11 Stormvermin died struck by Cannon ball and bolts of Organ Gun. Impressive display of ballistic skills. This is how true Dwarfs do their best in the heat of the battle! At this rate there will be no rat-men to fight in close combat. Guns will shoot them down to the bits and pieces! These dwarf-things are annoying, yes they are…it’s time to get rid of them once and for all – Quicksqueek thought and ordered all of his army to march forward. Clanrats, Slaves and Stormvermin moved towards the enemy line. Of course, both Doomwheels did not need any order or permission to roll. Clan Skryre Engineers controlling are quite independent and they do not listen to any of Grey Seers, and especially not to such inexperienced ones like Quicksqueek. They moved forward at full speed. Unfortunately the Winds of Magic gave almost no power to Grey Seer. And no power means obviously no spell casting. Allright, lads! These wicked chaos abominations are coming to us! Give’em lead! Give’em one way ticket back to hell where they came from! – shouted Thane Durgin Finnsson, but this time he pointed one of Doomwheels as a target. 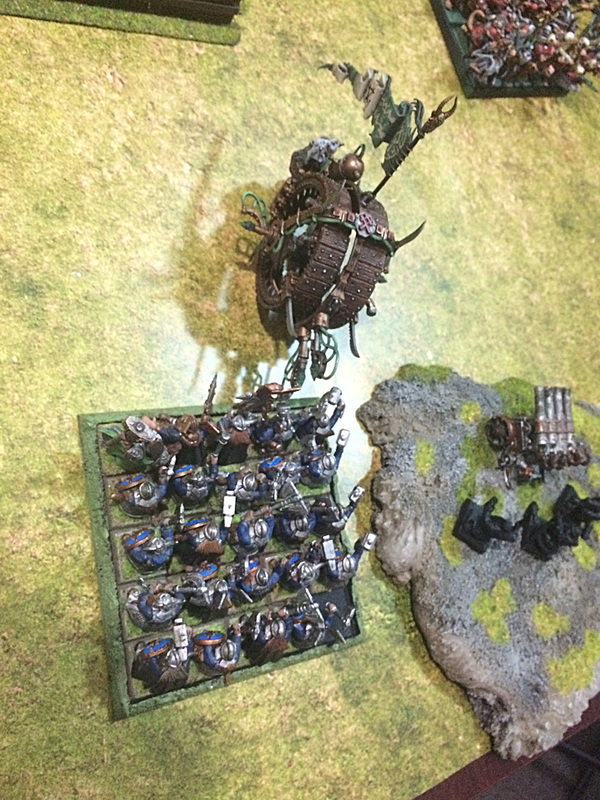 Thunderers, Cannon and Organ Gun – they all shot at Doomwheel – this crazy Skaven invention. Unfortunately Cannon ball stuck just few meters in front of the rolling wheel, and Organ Gun along with Thunderers managed to only damage the construction a little. Just, too bad – Cannon could destroyed it entirely… only if the crew aimed more carefully. Meanwhile, Skaven regiments were getting closer every minute. In fact they were close enough to get contact with Dwarfs. 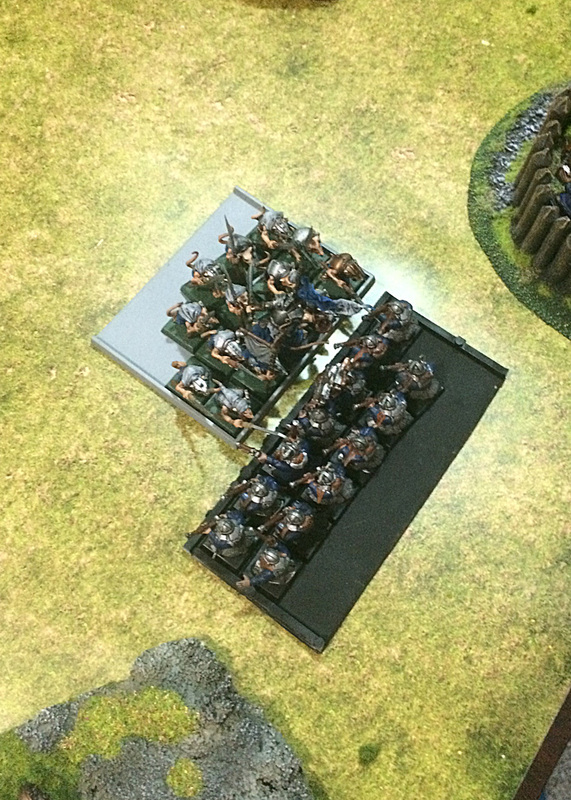 One of Doomwheels ( this one on eastern flank) rolled into unit of Dwarf Warriors! The impact was enormous! Four of Dwarfs died crushed by the wheel (and one more zzaped by lightning from Warp generator). Thankfully, Dwarfs morale were strong – they had still many ranks of brave warriors and the banner were proudly waving in the sky. They will not break! Not right now – the fight is here and now! Lord Quicksqueek swore silently under his nose. Dwarf-things are like pests – annoying him constantly. First, this blasted stronghold, and now – they are not giving up. Doomwheel should have crushed them all! And instead, they chanting something in this jabberish imitation of language of them. Curse on them! Quicksqueek pull the power from the Winds abowe to cast Curse of The Horned Rat, the most powerful, Dreaded 13th Spell. The energy was cumulating in his staff, while we was slowly saying the words of invocation. Seeing this, Runesmith Brokk Brokksson, simply broke the seal of Rune of Spell Breaking, and the magical energy were sucked back to the sky. The spell was dispelled. We are here, boys! We are finally made it trough! Pick axes up and here we go! – cried Gromli, the Prospector of the Miners. The tunnel they dug were finished. The exit were located on the western side of the battle across the river. The regiment of Miners rushed out the tunnel and stood in full combat formation, ready to fight rat-men. Miners getting out the tunnel. All other regiments remained still. Warriors were fighting Doomwheel, Longbeards prepared themselves for Skaven charge. Thunderers and artillery were ordered to continue shooting. Dwarf Cannon fired, but the ball miss Stormvermin by inches. …but wait! Organ Gun also fired at Stomvermin and the havoc caused by the salvo was unimaginable! 13 Skaven were shot by the bullets. Thirteen! That was almost complete annihilation of the regiment! 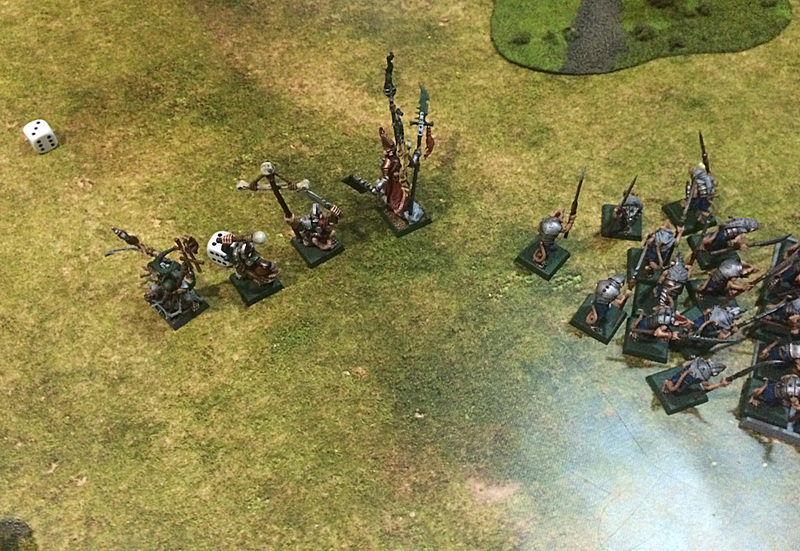 Only few Stormvermin left to fight…or well, or maybe not… Grey Seer tried to control panicking Skaven, but his efforts were futile. Brave and unbeatable elite regiment started to flee… Organ Gun crew cheered! That was impressive shooting! Stormvermin panic after being shot by Organ Gun. At the same time Thunderers shot down 6 of incoming Clanrats. The Skaven swarm were getting smaller and smaller. More Skaven shot by Thunderers. 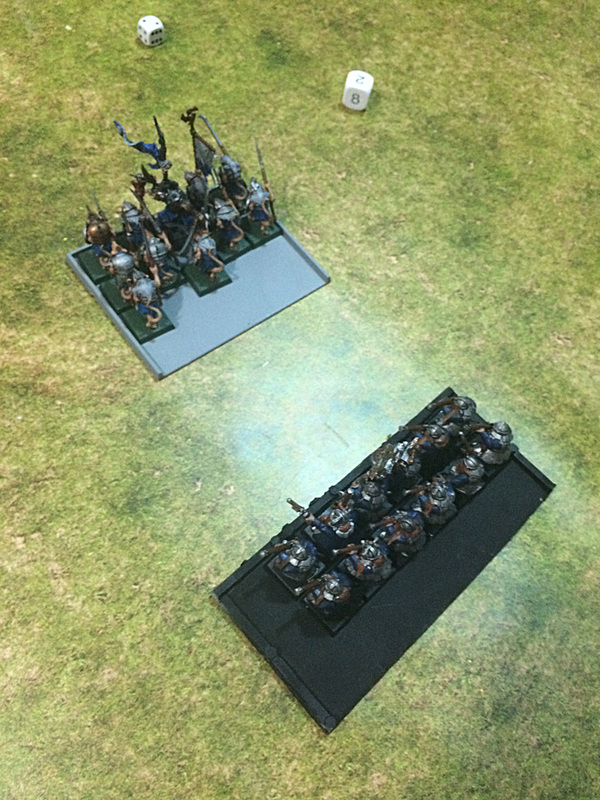 …and on the east side combat between Dwarf Warriors led by Thane Durgin Finnssonand Doomwheel continued. Clan Skryre machine is very resilient construction and Dwarf warriors were not be able to damage it even slightly, but thanks to their strength in numbers and the regiment banner they were able to shake morale of Warlock Engineer controlling Doomwheel and brake him from combat. Thane decided not to pursue. Holding the defence line – this was the priority. Grey Seer and his remaining handful of bodyguard Stormvermin rallied. And Doomwheel – quite opposite. Wheel controller was so shaken and so careless that he directed the wheel onto one of the trees in nearby woods. Thankfully the damage was not that big. Meanwhile, the second Doomwheel rolled into regiment of Longbeards, Clanrats charged Thunderers and Skavenslaves moved west to confront Miners getting out of the tunnel. Stormvermin rally, one Doomwheell roll into the woods and another charge Longbeards. Doomwheel’s impact on Longbeards were amazing! First of all, 3 of these veteran Dwarf warriors were electrified by warp charge and 3 more died of the impact. It was already enough to break them – they couldn’t bear the sight of their comrades crushed by massive wooden wheel. They fled off the battlefield. Chased, obviously by Doomwheel. Maniacal laugh of it’s driver sounded over the battle. Finally first triumph of Lord Quicksqueek’s army! Doomwheel charged Longbeards and another one is broken going into the woods. Meanwhile, Thunderers stood and shot and charging Clanrats. They killed only 2 of Skaven, and the fight begun. Clanrats lead by chieftain Tax killed only one Dwarf. In return also only one Skaven fell dead under the Dwarfs’ axes. Dwarfs did not loose their nerve for even slight second and remain unbroken. This fight will go on. 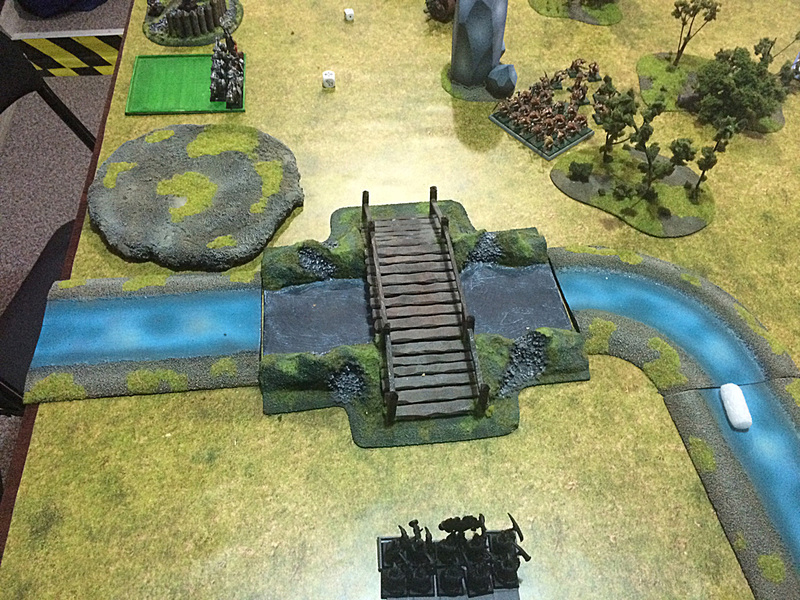 Miners proceed to the bridge over the river to confront Skavenslaves. Meantime, on the east, Thane ordered his Warriors to turn and aid Thunderers in their fight. Well, maybe not at this moment, but soon as they will bea ble to charge them. …and artillery continued their shoot-out. Cannon crew took as the target broken Doomwheel. Aim and fire! Simple as that – and the wheel fell apart. All rats inside scattered away and Warlock Enigenner died crushed down by pieces of wood and metal. Horrible death. Organ Gun at the same time aimed Stormvermin (well, remaining two of them plus Grey Seer and Raddrish The Last – Battle Standard Bearer). 18 shots were fired (!) killing instantly Skaven Chieftain and last Stormvermin. Grey Seer saved by Talisman of Preservation (but badly wounded) took the most tactical decision in such uncomfortable situation. Withdraw (or flee in panic as also you can call it:). Dwarf Artillery – Cannon, and especially Organ Gun performance in this battle were extraordinary. Stormvermin, Clanrats, Doomwheel – they all felt the exemplary ballistic skills of Dwarf Engineers. Good Job, lads! Way to go! – praised Thane Durgin – let them perish! Lord Quicksqueek felt somewhere inside that the battle was lost. Traitors among Skaven ranks. That was their fault. He continued to flee as far as possible from this wicked place, hoping to regroup somehere is more safe, where dwarf-things will not bother him anymore. Doomwheel driver did not care that Grey Seer is fleeing, he wanted more glory for himself. After hacking down all Longbeard, he wasn to kill and destroy! Primal fury filled his veins. Kill-kill dwarf–things – that is all he wishes. The Wheel rolled back to the battlefiled, but it was to far from any Dwarf unit or warmachine to get into close combat. Lightnings struck Cannon on the hill, but strength of electric charge was to weak to damage it. Meanwhile on the west, Slaves charged Miners, who secured the bridge over the river. This fight was swift. 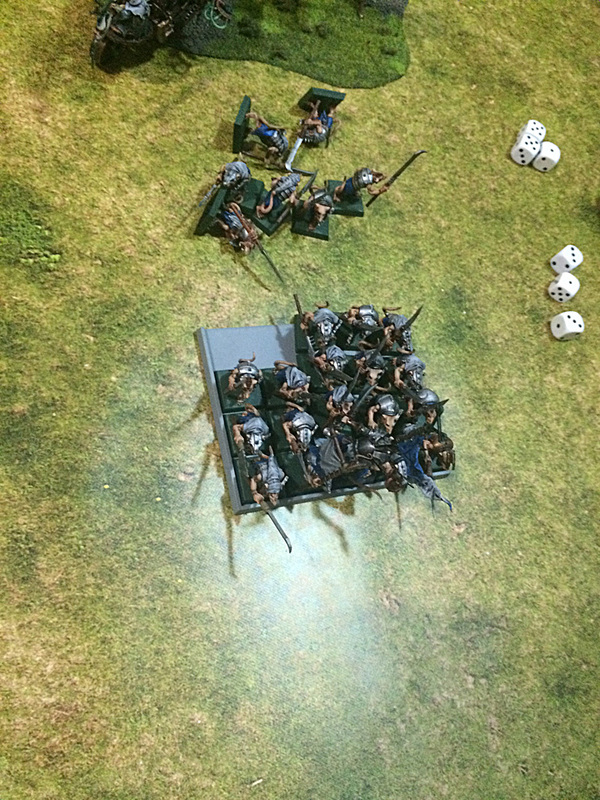 Miners’ pickaxes were falling down on Skaven heads with amazing precision. 5 of them were killed, and no harm were done to Dwarfs. It was matter of minutes, when Slaves were fleeing like… rats. Miners pursued them and force them to run away. Swift fight between Slaves and Miners. In the middle of battlefield, Clanrats tied in close combat with Thunderers, were slowly starting to be surrounded from all sides. Miners from the west and Dwarf Warriors from the east. Thunderers killed 3 Clanrats and Skaven start to feel entrapped here. They could not fight back. 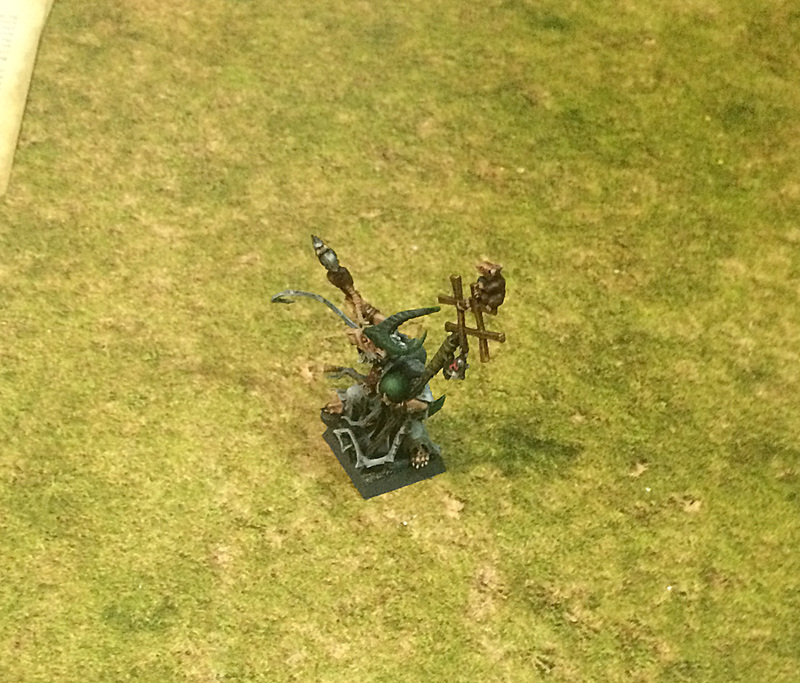 Tax, mighty Skaven chieftain – he felt it’s time to run. Run as fast as only Skaven can do. Clanrats joined their brave leader and they fled the combat. Dwarfs, even then they have shorter legs than Skaven, caught them in pursue in a moment. 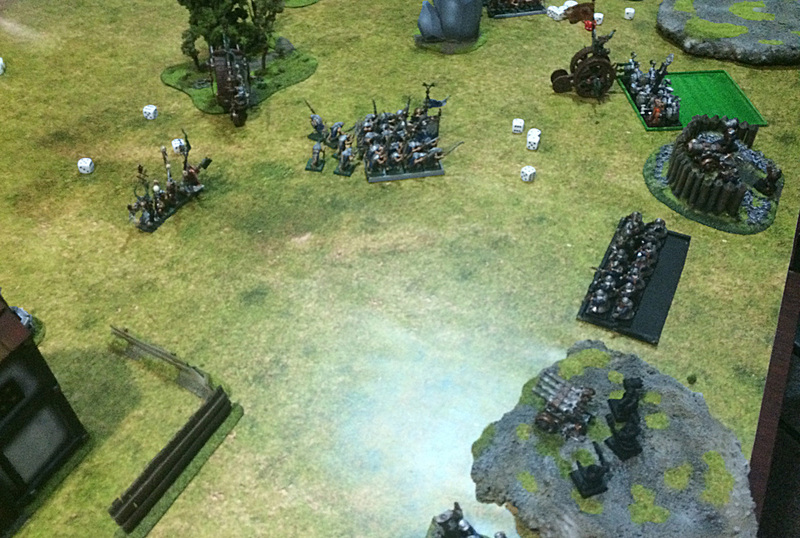 The battle was lost for Skaven, but Dwarfs wanted to finish them all. Organ Gun shot all the barrels at Doomwheel, destroying it completly. 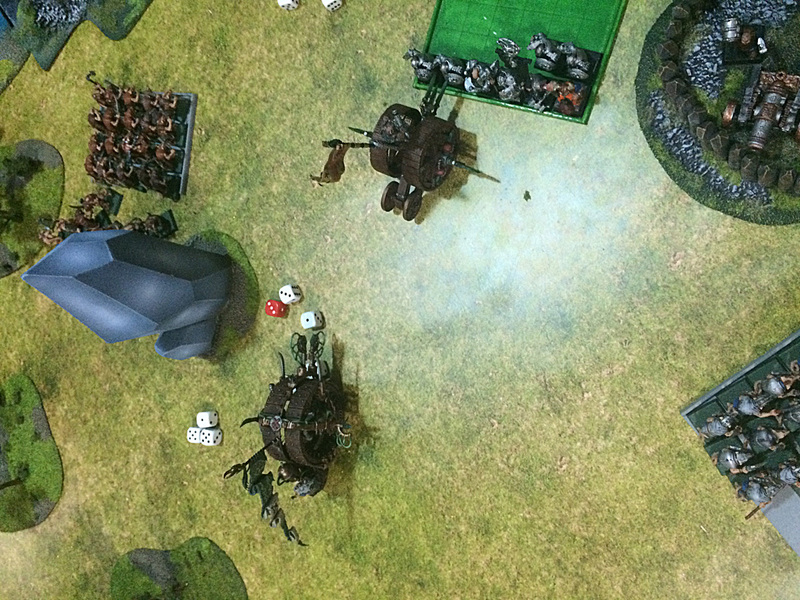 …and Cannon took carefully aim at fleeing Lord Quicksqueek. …and Dwarfs started to chant their song of glory. Lord Quiksqueek did not die. Badly wounded, he managed to find some safe hideout and recover. He also find some more Skaven to gather new army. His story was not over, but as we all know, it was not the story filled with won battles. It was the story full of misery, treachery and bad luck (you can find more battle reports from Lord Quicksqueek’s seek for glory in Battle Reports section). This was my 10th battle with the Skaven force I was preparing for few months – the balance is quite depressing. 4 victories and 6 loses. Well, and if we exclude three WHFB 5th edition games – it is even worse. 1 victory and 6 loses ( at least I won 3 games of Herohammer, yay!!!). I know that. I acted like a rookie, but I promised myself at the very start of my Skaven army. My regiments will not be larger than 30 warriors. Such blocks look so nice on the battlefield. Larger regiments disturb my sense of aesthetics. And the army become little bit overpowered. 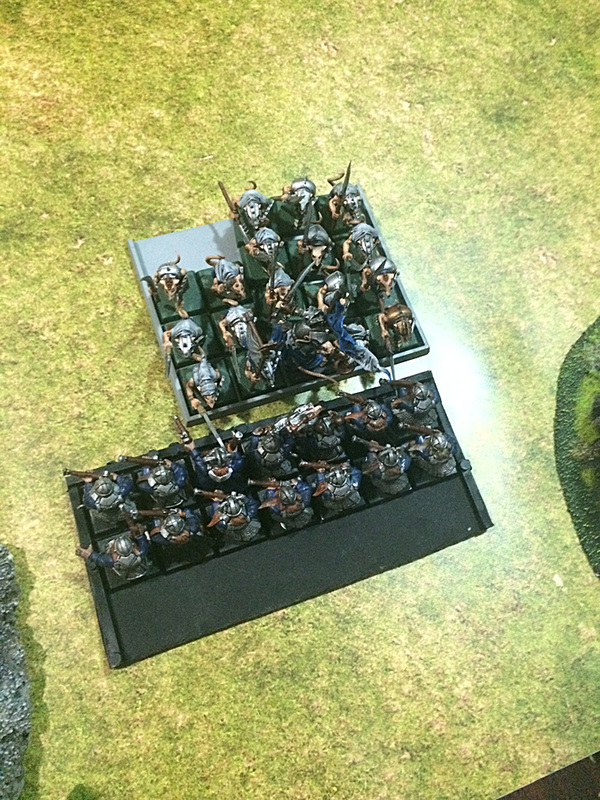 I prefer to play old way – regiments of 20-30 Skaven are good enough to play. And it means I will lost the battle, because I don’t use hordes – well, let it be. No worries. I have fun – no matter – I win or loose. 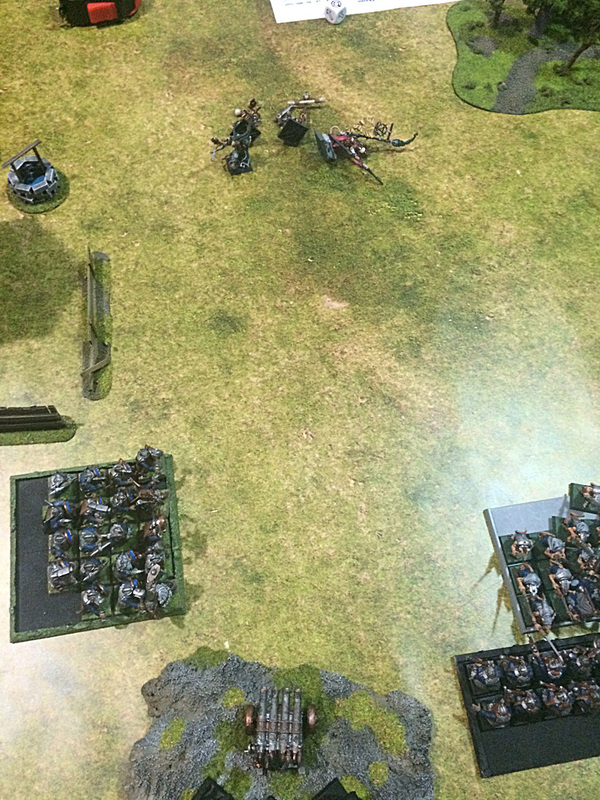 As I wrote before – that was my last battle with Grey Seer Quicksqueek as general. Right now in my backpack I have 2 Plague Priests and 30 Plague Monks waiting to be painted. The general concept of my next Skaven army will be totally different from what I played so far. The time has come, that Clan Pestilens will release their wrath and spread their pox upon weaklings in every corner of the world. Buahahahaha! I’m so exited with this – I just need to add few Plague Canser Bearers, Plague Furnace, and those Gutter Runners (to be able to fight against Dwarfs, duh). Maybe Plague Catapult as well? I’ll think about it. The truth is I want almost pure Clan Pestilens army – no Clan Skryre machines, no Assassins and definitely no Grey Seers. In larger scale points battles I plan to use Lord Sklork as general – and in that way Plague Monks will count as my core choice. Oh, yes-yes. Clan Pestilens will give me so much fun. And for 6th edition games I have prepared something special – Lord Nurglitch! Oh, jolly, this will be exciting! I think next year I will have everything ready and Skaven Plague will purge the world above (…and I hope I will have more luck with running this army). So long Lord Quicksqueek. Clan Pestilens takeover. Future plans: So, here I am. cairns Airport, leaving Australia in few hours. My holidays end, and even though I will travel a lot for upcoming months – mostly I’ll work to get some money for this epic journey. And while settled, I will have more time to paint and write here. Starting from next week. …and in Adelaide I met in person one of the bloggers from WordPress – Kym of classic40k.wordpress.com blog. (it was a big pleasure to meet you, Kym!) We had a superb battle of Warhammer 40k 2nd edition. My Blood Angels vs Orks. Battle report soon! Previous PostGame of Travel vol. 2 – starts now! Next PostBlood Angels Sanguinary Priest painted. Yay!